In the aftermath of the Grenfell Tower fire, a group of local women gathered together to cook fresh food for their families and neighbours. Over the chatter and aromas of the kitchen they discovered the power of cooking and eating together to create connections, restore hope and normality, and provide a sense of home. This was the start of the Hubb Community Kitchen. 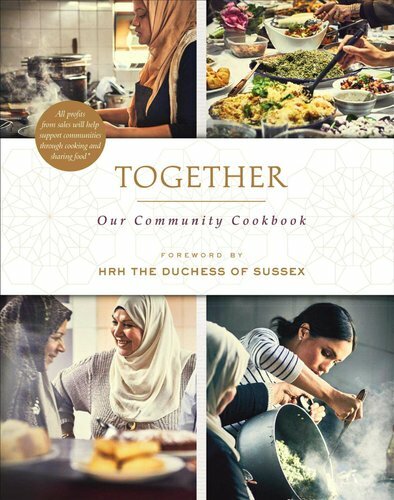 Together is a storybook of this West London community, showcasing over 50 delicious recipes from the women of the Hubb Community Kitchen and including a foreword by HRH The Duchess of Sussex. Every dish tells a story of history, culture and family, and each has been developed to use few ingredients and easy methods so that anyone can cook these personal recipes. Together features mouthwatering recipes including Green Chilli and Avocado Dip, Coconut Chicken Curry, Aubergine Masala, Persian Chicken with Barberry Rice, Caramelised Plum Upside-Down Cake, Spiced Mint Tea and lots more.